We are going to discuss that how can we install or configure a DSL internet connection our-self. The whole process of DSL installation is very simple and easy. First of all we need a DSL service enabled telephone line, if your telephone line has no activated DSL service then call your service provider to activate this service for you. ISP should activate this service for you at some monthly charges or rental fee because DSL service is not free. In Pakistan the widely used DSL service is powered by PTCL (Pakistan Telecommunication Company Limited) and their support staff will always visit your premises to install or configure your DSL internet connection when you request for this service. As PTCL or any other ISP has its own technical and support staff, so there is no need to worry about you DSL installation. Just in case if you want to do it yourself then this guide is for you. By following this guide you can also speed-up or boost your DSL connection. How to Install a DSL Line & Setup a Connection to the Internet ? We assume that we have a telephone line with activated DSL service. Line hole of DSl filter connects to PTCL wire or Wall phone Jack (RJ-11 Jack). Modem hole of DSL filter connects to the DSL jack of the ADSL CPE (Customer Premises Equipment) or Modem / Router. Phone hole connects to a telephone set. Attach one end of LAN wire (RJ-45) to the LAN interface of CPE and the other end to the LAN wire to the LAN interface of computer’s LAN card.Connect the Power Adapter to the AC power plug and attach the connector of adapter to the CPE and switch it on. Link Indicator lights will lit up and show the connectivity. ADSL light will start blinking and soon will be static as a sign of connectivity with our system, if the line is properly jumpered in PTCL premises with the DSLAM (Digital Subscriber Line Access Multiplexer). Joint less and direct cable line from the nearest PTCL pole or cabinet must be connecting to your splitter (DSL Filter) and then all the phone extensions must be taken from the phone hole of splitter. The Drop wire distance from PTCL pole or Cabinet must not be ideally more than 50 meters. Switch on you computer / laptop. Go to Start Menu > Control Panel > Network and Internet Connections > Network Connections. Check that the Local Area Connection is enabled. 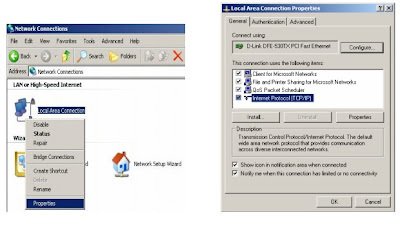 Right click local Area network and click properties. Follow Internet Settings for PTCL DSL Modem and Router and enter the settings in your Modem or Wireless Router. Now, by following this guide, your DSL connection should be established successfully. The above described connection or wiring arrangement will also help you to speed up your DSL connection. How to Boost or Speed Up DSL Connection ? The Drop wire distance from PTCL pole ideally more than 50 meters. Joint less and direct cable line from the nearest PTCL pole or cabinet must be connecting to your splitter (DSL Filter). Design your network in such a way that uses less wiring (short distant cables and wires are useful). ADSL line parameters: Note the SNR Margin (Noise Margin) and Line Attenuation. SNR (also known as Noise Margin) must be higher than 08 dB and Line Attenuation must be less than 45 dB for establishing a stable DSL connection. Hope this guide helped you in understanding DSL technology and helped you in establishing a stable DSL Connection. If you are still facing any problem or difficulty then you can contact-us for technical services.